Jurassic World was a funhouse. Fallen Kingdom is a madhouse. Maybe Universal should issue a warning that this movie might cause headaches. It’s not from the use of strobe lights or from the theatres’ high-volume sound systems or from any wild camera movements. It’s from all the forehead smacking committed by sensible audience members subjected to watching so many stupid people doing so many stupid things. It’s hard to pin it down. That moment. The moment when all narrative hope is lost. Maybe it was early on, with all the protestors rallying in Washington, D.C. and brandishing signs reading, “Dinosaurs have rights, too!” Or maybe it was the moment when a tough-as-nails soldier entered a cage and attempted to extract a huge tooth from a seemingly incapacitated raptor — so he can add it to the necklace he’s making. There was also a ludicrous dinosaur auction, in the rock-solid basement of the sprawling Lockwood Estate. There are others. Too many of them. All those scenes of random acts of stupidity. Fallen Kingdom gets off to a promising start with some grisly action right out of the gate. It’s a dark and stormy night on Isla Nublar. And the dinosaurs are wide awake while silly homo sapiens do their thing. One poor human narrowly escapes one dinosaur, almost plucked off a rescue ladder dropped from a helicopter, only to be gobbled up by another hungry creature. And then the rest of the movie happens. Here’s the crux of the story. Following the dinosaur-stomping demolition of Jurassic World in 2015, a volcano on Isla Nublar has started erupting. That’s caused mass panic in the scientific and dino-hugging communities. Save them. For the children! The essence of the message is emblazoned across all forms of media: Humans are expendable. Rescue the violent dinosaurs. 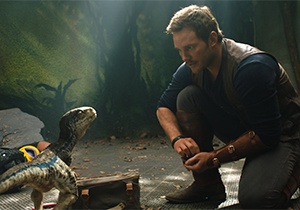 It’s perfectly in keeping with the high-minded and misguided tone set by Owen (Chris Pratt, Guardians of the Galaxy) in Jurassic World, “Maybe progress should lose for once.” And it’s rather contrarian to the tone of Spielberg’s Jurassic Park movies of the ’90s. Consider it another sign of the times. And so it happens Owen reunites with Claire (Bryce Dallas Howard, Gold) on what they believe to be an altruistic mission to save 11 species of dinosaurs. Indeed. There’s adventure and excitement at first and then one colossally ill-conceived decision after another is made. And then the screaming begins. The story is bookended by Ian making statements in D.C. At the beginning, he advises against saving the dinosaurs from the volcano and instead letting nature run its course. At the end, his comments reach for some degree of profundity, as if to wipe away 2 hours of bad ideas. Given the fundamentally lazy story, there’s still some entertainment value to be mined. The special effects are awesome, including a lot of slick animatronics. And there are a few good thrills, or at least ideas for thrills that would carry more punch in a more taut, intelligent storyline. The problem is, too many of the thrills are thrills of convenience. In one instance, poor Owen, knocked out by a powerful tranquilizer, squirms and flops around while avoiding a dino attack. Then, in short order, he’s running full tilt. The thrill is gone. If only there was more real adventure and less expository, self-serving humans (some of them stand as strong case material for letting the human race go extinct). And there’s a rather cool subplot that… Well, it can’t be — won’t be — revealed here. It gets the mind spinning about all the serious story possibilities that were waved goodbye in favor of this reckless story of Jurassic endangerment. For the oodles who’ll no doubt venture out to see the Fallen Kingdom (it’s already pulling in major moolah abroad), stay through all 8 minutes of end credits for one last morsel — a tease of what’s to come. All of this madness tees up what promises to be a messy next installment; it’s unfortunate it took such a long, dopey journey to get there.